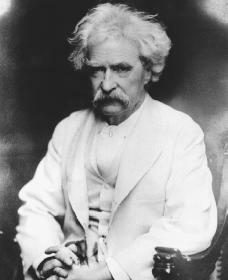 Mark Twain, American humorist (comic writer) and novelist, captured a world audience with stories of boyhood adventure and with commentary on man's faults that is humorous even while it probes, often bitterly, the roots of human behavior. Mark Twain was born Samuel Langhorne Clemens on November 30, 1835, in the frontier village of Florida, Missouri. He spent his boyhood in nearby Hannibal, on the banks of the Mississippi River, observing its busy life, fascinated by its romance, but chilled by the violence and bloodshed it bred. Clemens was eleven years old when his lawyer father died. In order to help the family earn money, the young Clemens began working as a store clerk and a delivery boy. He also began working as an apprentice (working to learn a trade), then a compositor (a person who sets type), with local printers, contributing occasional small pieces to local newspapers. At seventeen his comic sketch "The Dandy Frightening the Squatter" was published by a sportsmen's magazine in Boston, Massachusetts. In 1853 Clemens began wandering as a journeyman printer to St. Louis, Missouri; Chicago, Illinois; New York, New York; and Philadelphia, Pennsylvania; settling briefly with his brother, Orion, in Iowa before setting out at twenty-two years old to make his fortune, he hoped, beside the lush banks of the Amazon River in South America. Instead, traveling down the Mississippi River, he became a steamboat river pilot until the outbreak of the Civil War (1861–65), when Northern forces clashed with those of the South over slavery and secession (the South's desire to leave the Union). In 1861 Clemens traveled to Nevada, where he invested carelessly in timber and silver mining. He settled down to newspaper work in Virginia City, until his reckless pen and redheaded temper brought him into conflict with local authorities; it seemed profitable to escape to California. Meanwhile he had adopted the pen name of Mark Twain, a riverman's term for water that is just safe enough for navigation. In 1865, Twain began to write a short story, The Jumping Frog of Calaveras County, which first brought him national attention. Most of his western writing was hastily, often carelessly, done and he later did little to preserve it. In 1865 the Sacramento Union commissioned Mark Twain to report on a new excursion service to Hawaii. His accounts as published in the newspaper provided the basis for his first successful lectures and years later were collected in Letters from the Sandwich Islands (1938) and Letters from Honolulu (1939). His travel accounts were so well received that he was contracted in 1866 to become a traveling correspondent for the Alta California; he would circle the globe, writing letters. In 1870 Twain married Olivia Langdon. After a brief residence in upstate New York as an editor and part owner of the Buffalo Express, he moved to Hartford, Connecticut, where he lived for twenty years; there three daughters were born, and prosperity as a writer and lecturer (in England in 1872 and 1873) seemed guaranteed. Roughing It (1872) recounted Mark Twain's travels to Nevada and reprinted some of the Sandwich Island letters. alike. With more exotic and foreign settings, The Prince and the Pauper (1882) and A Connecticut Yankee in King Arthur's Court (1889) attracted readers also, but T he Adventures of Huckleberry Finn (1885), in which Mark Twain again returned to the river scenes he knew best, was considered unacceptable by many. Twain's Tom Sawyer, better organized than Huckleberry Finn, is a narrative of innocent boyhood play that accidentally discovers evil as Tom and Huck witness a murder by Injun Joe in a graveyard at midnight. The boys run away, are thought dead, but turn up at their own funeral. Tom and Huck decide to seek out the murderer and the reward offered for his capture. It is Tom and his sweetheart who, while lost in a cave, discover the hiding place of Injun Joe. Though the townspeople unwittingly seal the murderer in the cave, they close the entrance only to keep adventuresome boys like Tom out of future trouble. In the end, it is innocent play and boyish adventuring which really triumph. Huckleberry Finn is considered by many to be Mark Twain's finest creation. Huck lacks Tom's imagination; he is a simple boy with little education. One measure of his character is a proneness to deceit, which seems instinctive, a trait shared by other wild things and relating him to nature—in opposition to Tom's tradition-grounded, book-learned, imaginative deceptions. The Adventures of Huckleberry Finn, a loosely strung series of adventures, can be viewed as the story of a quest for freedom and an escape from what society requires in exchange for success. Joined in flight by a black companion, Jim, who seeks freedom from slavery, Huck discovers that the Mississippi is peaceful (though he is found to be only partially correct) but that the world along its shores is full of trickery, including his own, and by cruelty and murder. When the raft on which he and Jim are floating down the river is invaded by two criminals, Huck first becomes their assistant in swindles but is finally the agent of their exposure. Whatever its faults, Twain's Huckleberry Finn is a classic. Variously interpreted, it is often thought to suggest more than it reveals, speaking of what man has done to confuse himself about his right relation to nature. It can also be thought of as a treatment of man's failures in dealing with his fellows and of the corruption that man's only escape is in flight, perhaps even from himself. Yet it is also an apparently artless story of adventure and escape so simply and directly told that novelist Ernest Hemingway (c.1899–1961) once said that all American literature begins with this book. After a series of unsuccessful business ventures in Europe, Twain returned to the United States in 1900. His writings grew increasingly bitter, especially after his wife's death in 1905. The Man That Corrupted Hadleyburg (1900) exposed corruption in a small, typical American town. Eve's Diary (1906), written partly in memory of his wife, showed a man saved from bungling only through the influence of a good woman. In 1906 Twain began to dictate his autobiography to Albert B. Paine, recording scattered memories without any particular order. Portions from it were published in periodicals later that year. With the income from the excerpts of his autobiography, he built a large house in Redding, Connecticut, which he named Stormfield. There, after several trips to Bermuda to improve his declining health, he died on April 21, 1910. Kaplan, Justin. Mr. Clemens and Mark Twain: A Biography. New York: Simon and Schuster, 1966. Krauth, Leland. Proper Mark Twain. Athens: University of Georgia Press, 1999. Paine, Albert Bigelow. Mark Twain, A Biography: The Personal and Literary Life of Samuel Langhorne Clemens. New York: Harper & Bros., 1912. Reprint, Philadelphia: Chelsea House, 1997. Twain, Mark. The Autobiography of Mark Twain. New York: Harper, 1959. Reprint, New York: Perennial Classics, 2000. Ward, Geoffrey C., and Dayton Duncan. Mark Twain. New York: Knopf, 2001. Wecter, Dixon. Sam Clemens of Hannibal. Boston: Houghton Mifflin, 1952. Reprint, New York: AMS Press, 1979. Howduy y'all! This is a great Article about Mark Twain, it has lots of good information, thank you author for this incredibly well thought out biography of Mark Twain.